It will be better if you know sample interview questions and answers before attending any job interview. In this article, you can see the sample interview questions and answers asked in many interviews. It is important to prepare for a job interview before attending it. If you are ready to give effective answers, then your chances of selecting to that particular job are also high. Don’t memorize your answers but try to analyze your answers. Try to reach interviewers expectations with your skills and knowledge. Try to analyze what they are expecting from you. 1.1 1. Tell me about yourself. 1.2 2. What is your strength? 1.3 3. What is your greatest weakness? 1.4 4. How do you handle stress and pressure? 1.5 5. Why should we hire you? 1.6 6. Why do you want to work here? 1.7 7. What do you know about the company? 1.7.1.0.1 Want to Learn More? It is the top-most interview question asked in many interviews. Prepare and practice self-introduction before attending for any interviews. “Tell me about yourself” helps to determine whether you are suitable for the job or not. While answering this question, do remember that don’t answer too much and too little. Make this simple and effective. An interviewer wants to know that how you can describe yourself. Start with your name and then your place information. Also, tell about your education in short and family details in short. In addition to this If you have, you can explain your job experience. My name is Anil. I live in Bangalore and I have done B.Tech in Computer science. I have four members in my family in Bangalore. Make sure that yourself introduction should be simple. It should not be lengthy and it should not be too small. This is also another common interview question. Interviewers want to know your strengths and how your strengths are beneficial for the company growth. Your strengths will show that you are the suitable candidate for the specific job. There are many examples of strengths and weaknesses that you can find on the Internet. I am an honest, self-motivated and hard working person with positive attitude towards my career and my life. It is another sample interview question that interviewers want to know about your weaknesses. Here they ask about your weakness because they want to know if your weakness affects the job profile. They may not select you if your weakness affects the job profile. While giving the answer you can include some points like impatient, sensitive, straightforward, trust people very quickly and so on. Don’t tell more than two to three weaknesses because this may reduce your chances of hiring. I cannot say no when someone asks for help and I am a bit lazy about which I am not interested. 4. How do you handle stress and pressure? This is one typical question asked in many job interviews. the main intention of asking this question is to know your behavior on the job stress and pressure. Your behavior is also important for any organization. To answer this question, give any previous example that how you handled stress and pressure in your previous work or in your college life. stress is very important to me because I do best under stress and pressure. I’ve found that I really enjoy working in a challenging environment. By responding to this question, you should able to show that you are the best candidate for the specific job. Here you have to do marketing for yourself. Try to share your knowledge and work experience if you have. Explain whatever skills you have. Relate your job to your career goals. Sir, as I am a fresher, I have theoretical knowledge. I can do hard work for my organization and I will put all my efforts for the good progress of the organization. I will try to fulfill all the needs of the company and also complete the work given to me on time. With reference to my work experience, I satisfy all the requirements for this job. I am sincere with my work and would never let you down in anyway. Many interviewers ask this question in interviews. They want to know that why you are really interested in working in their company. Try to give your satisfactory answer to this question. While giving answer tell them the best reason that why you are really want to work in their company. You can tell them what you like about the company. If you share that what you like about the company, then they can able to find your interest in the company and relate it to your career goals. Also, explain to them that how working in their company helps you to achieve your career goals. We know that everyone is working to achieve their long-term goals so explain to them how your job will help you to achieve your goals. Sir, it is a great privilege for anyone to work in a reputed company like yours. When I read about your company I found that my skills are matching your requirements. Here I can showcase my skills to contribute to the company growth. 7. What do you know about the company? It is one of the most interesting interview questions asked in many interviews. Many interviewers want to know your knowledge about the company. Before attending an interview you should do some research work regarding that company. That is the study of their company, know the name of their owners and partners and update your knowledge about their competitors. It is one of the fastest growing companies in India. The work environment in this company is very good. People feel proud to be part of the company as the company provides full support to their employees in professional life so I have good opportunity to show my talent. Where do you want to see yourself after 5 years? Tell me, What are you passionate about? What type of environment do you prefer? You can learn about this Interview techniques in detail by following the Famous book by Robin Ryan. He wrote a book on mastering the job interview and landing the job of your dreams. 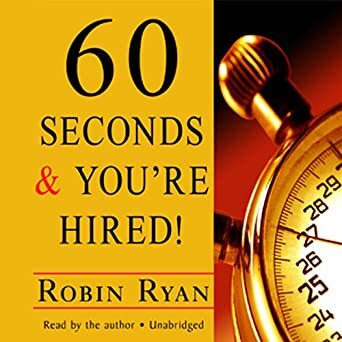 The book is named as 60 seconds and You are hired. Hope you are enjoying our articles. in his article, we mentioned only Job Interview Questions and answers. the above “sample interview questions” will be helpful for many fresh graduates before attending for an interview. Always we update our articles. you can find more details on Job Interview questions, tips for Interviews and much more information soon. Please comment below. We need your suggestions for better performance. For employers, we have written an article called Questions to ask when interviewing someone. we hope you will enjoy this article too.